Oregon was first spotted by Spanish sailors in the 1500's, but it was only in 1792 when Captain Robert Gray, in the Columbia, discovered the river named after his ship and claimed the area for the U.S.
From then on, American settlers began populating the territory, including a settlement by millionaire John Jacob Astor who established a fur trading post, Astoria, in 1811. Today, Portland, claims the lion's share of popular tourist attractions within the state, beginning with any one of the city's top-rated city parks including Waterfront Park (for breathtaking views of the city skyline) and Washington Park -- home to Portland's renowned International Rose Test Garden featuring acres of new hybrid roses introduced by the American Rose Society. Also don't miss a stop at the Japanese Garden located within the park to cool your heels after a busy day of sightseeing. Other must-see outdoor attractions around Portland include the family-friendly Oregon Zoo, and the impressive Portland Classical Chinese Garden in the city's Chinatown district boasting the largest garden of its kind outside of China. While in Portland, also don't miss a pleasant afternoon trip to roaring Multnomah Falls to explore the region's impressive natural beauty outside the city. 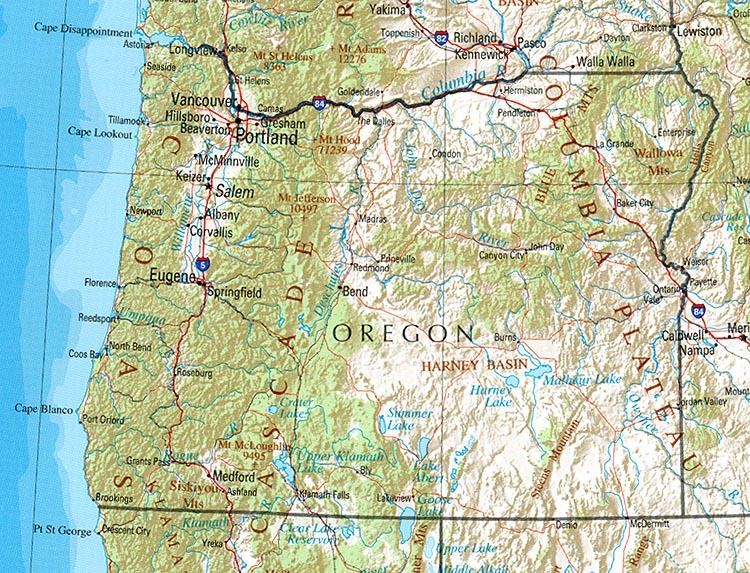 drives along Pacific Coast Highway 101 (middle); and outdoor adventures around Mount Hood. Meanwhile, for Oregonians, major scenic Oregon vacation spots are found all along the Columbia River area including Mount Hood with a multitude of opportunities for camping and spring river rafting. Other popular summer travel attractions include Oregon Coast driving tours along U.S. Highway 101, Oregon Caves National Monument, Hells Canyon, and Newberry Volcanic National Monument. • The Tillamook Cheese Factory, open to visitors, is the largest cheese factory in the world. • Mill Ends Park in Portland, the world’s smallest official park, measures two feet across. It was created in 1948 for the leprechauns on St. Patrick’s Day. • The Carousel Museum in Albany, OR contains the largest collection of carousel horses in the world. Travel Oregon - Nicely done & designed with easy-to-use guides to Oregon history & culture, a complete trip planner including maps, pictures, hotel & restaurant guides, browseable by region with information on major attractions. Central Oregon Visitors Association - Focusing on the Bend area and nearby attractions with information on hotels & restaurants, sports, recreations & kid-friendly activities, photo gallery, maps. weather forecasts. Portland Oregon Visitors Association - A guide to the entire city with major & nearby attractions, day trips, hotel & restaurant guides, entertainment, nightlife, sports events, event calendar, visitor tips, maps & pictures.